61 percent of surveyed CMOs and sales leaders say cognitive computing will be a disruptive force in their industries—but are they ready for the disruption? ARMONK, New York - 08 Aug 2017: While marketing and sales professionals increasingly find themselves drowning in data, a new IBM (NYSE: IBM) study finds that nearly two thirds—64 percent--of surveyed CMOs and sales leaders believe their industries will be ready to adopt cognitive technologies in the next three years. However despite this stated readiness, the study finds that only 24 percent of those surveyed believe they have strategy in place to implement these technologies today. According to the new IBM Institute for Business Value (IBV) study, “From data deluge to intelligent insights: Adopting cognitive computing to unlock value for marketing and sales," while both CMOs and heads of sales agreed that “customer satisfaction” is the number one value driver for adopting cognitive solutions, practically speaking, many of those surveyed say they aren’t sure their organizations are currently set up to make a successful transition. The study, conducted in cooperation with Oxford Economics, is based on a global survey with 525 CMOs and 389 heads of sales across industries to determine the extent by which marketers and sellers aim to embrace cognitive. Cognitive computing, such as IBM Watson, is a next generation technology that can quickly understand and reason vast amounts of structured and unstructured data, like sounds and images, in the same way humans do—by reasoning, learning, and interacting to improve accuracy overtime. While traditional analytics can provide data for businesses to draw insights from, cognitive can more easily predict outcomes and turns those insights into actionable recommendations, which can impact real business decisions. Surveyed executives from businesses that have outperformed their competition for the past three years in revenue growth, profitability, or other factors, made up 13 percent of the study. 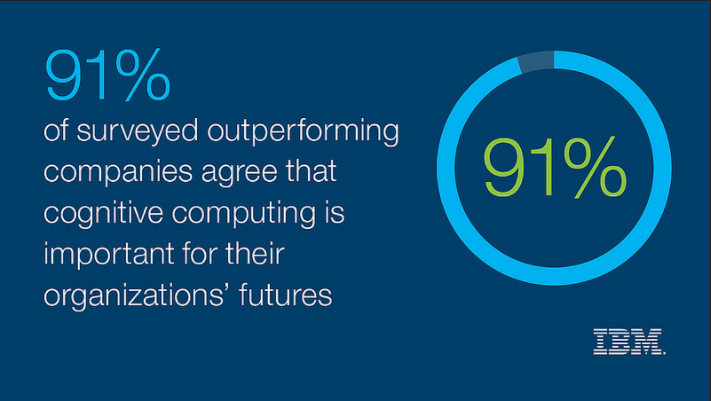 Of these surveyed Outperformers, 93 percent believe cognitive computing is mature and market ready, and 91 percent assert that cognitive computing is good for their organizations. Nearly a quarter—or 24 percent--of surveyed Outperformers report cognitive is already operational at their organizations, only 3 percent of other CMOs and sales executives claim the same. These Outperformers are ahead of the cognitive game with 73 percent already collecting and analyzing external market data. Make room for cognitive solutions in your businesses’ Digital ReinventionTM strategy— companies across multiple industries are in the midst of reinventing the customer experience with a variety of digital technologies, from mobile apps to Internet of Things (IoT) to virtual reality. These digital customer touchpoints are producing new sources of structured and unstructured data well suited for cognitive to inform companies about customers’ individual preferences, behaviors and attitudes. In fact, marketing executives listed “customer insights” as the primary way they could use cognitive to enhance their customer experience. Instead of seeing cognitive as a wholly separate initiative, CMOs and heads of sales should consider it a component of their Digital ReinventionTM strategy. Enhance employees’ business skills, not just their data analytics skills— people with analytical skill sets are in high demand. But because cognitive technologies do the analytical heavy lifting, what marketing and sales may need the most are people with a broad perspective of both company strategy and the nuts and bolts of the business. These employees can more easily discern business implications from cognitive insights and need strong decision-making skills, as well as an empathetic understanding of their customers to consistently deliver their companies’ brand promise. Start small, if necessary — but do start— many marketing and sales executives fear the shift to cognitive will require them to “rip and replace” the tools and processes they use to analyze customer data and create customer experiences. Instead, there are numerous types of cognitive solutions — from improved capabilities for personalization to content tagging — that marketers and sellers can implement in stages to target specific challenges and often can be integrated into companies’ existing cloud platforms and data management systems. By starting small, companies can begin to enjoy the benefits of cognitive computing and determine how best to expand over time. More than half of Outperformers have already started their shift to cognitive. The real risk would be to wait too long on the sidelines while the competition forges ahead.